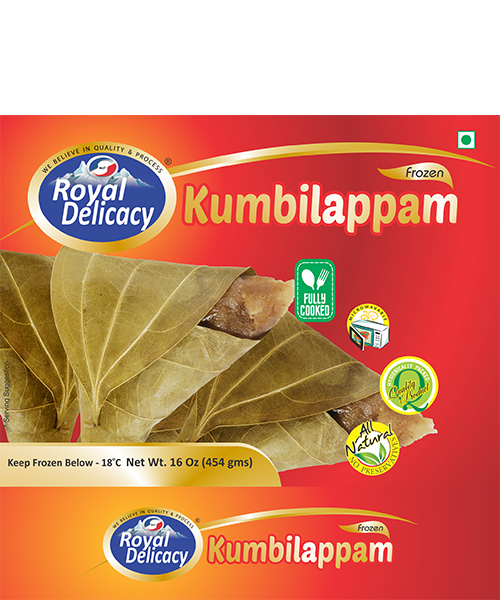 This is to declare that the Kumbilappam (Jack Fruit) are prepared by the following procedure. Make dough with rice flour, Jack Fruit paste, cardmom and salt. This dough is placed in the center of the leaf, (fold the leaf in corn shape). Place the adas in steamer, Then pre-cool the product before blast freeze at -32 °C and pack and stored at – 18 °C. The procedure is carried out so as to assure that the product is free from any type of contamination.